This 2.4 x 2.4m National Trust Orford Summerhouse has been installed in a corner of our customer’s large garden in Chippenham, Wiltshire to give them a relaxation space to enjoy during the warmer months of the year. The customer chose the Orford because she liked the traditional styling of the National Trust range, and she wanted a summerhouse that would look good sitting in a corner: the Orford fits this request perfectly as it is basically square in shape, with one of the corners chopped off to make room for the double doors, allowing it to slide into a corner easily. A corrugated sheet, made from recycled materials, is used to cover the roof of the National Trust garden buildings to add to the traditional look. We prefer to use this recycled corrugated sheeting than corrugated steel, as it is much lighter and it isn’t noisy when it rains. 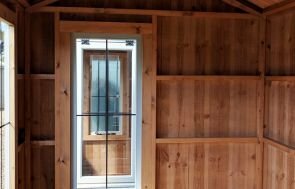 Other traditional features on the National Trust Summerhouses include vertical sawn boards for the external cladding, leaded windows, and black cast iron door and window furniture in the Fleur-de-Leys style for that extra pretty finishing touch. There are six paint colours to choose from our National Trust paint range, all chosen to be natural in colour and to suit the traditional style of the buildings. 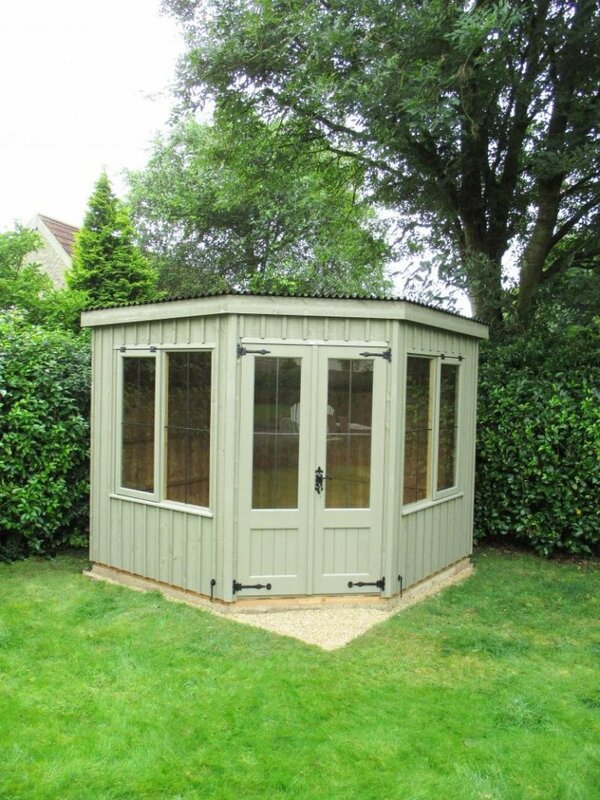 This customer chose to have their summerhouse painted in Wades Lantern, which is a green/brown colour that fits in very nicely with the natural greens of the grass, shrubs and trees that surround it. For more information on our National Trust range, or our own range of Summerhouses, please either call us on 01760 444229, or you can visit our Burford/a> or Newbury Show Centres.